Can an experience be both slow and gentle and yet simultaneously exhilarating and exciting? 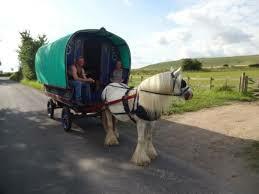 Well, a holiday in a gypsy caravan travelling the lanes of the Pewsey Vale evokes all those emotions and more. You go at your own pace – or more accurately the pace of the horse. No rushing. No panic. No engine noise. Just the gentle sound of the wheels on the tracks and the lanes; with nature close up so you can see the wonderful wild flowers of the Vale’s meadows and verges. Time for bird watching as you go – from yellowhammers to red kites – you are likely to see lots of species you just don’t get in your garden. 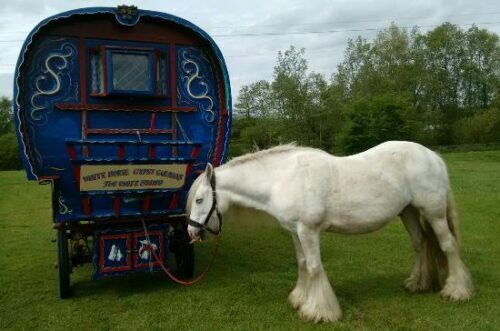 Polly has been running the White Horse Gypsy Caravans company for over 20 years, offering three-day breaks (starting every week on Tuesdays or on Fridays) in a traditional gypsy caravan, pulled by one of her specially trained, experienced and very well-behaved horses. Each day you will be able to stop for lunch and then park up overnight at one of the local hostelries. The journey in between your meal stops will take you through some of the most beautiful villages in Wiltshire. 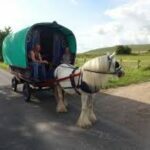 And you will see the most spectacular views of the Pewsey Vale from a unique perspective – touring the ancient lanes around and between not one, but two White Horses; Pewsey White Horse and Alton White Horse. An ideal holiday for families (up to two adults and two children) or groups of three adults, this is a unique experience that will help you relax and unwind – tranquil, spiritual and ancient, this is the perfect antidote to modern life. If you would like to bring a bigger group, then you could (by arrangement) bring some tents to accommodate the extra people. Polly would be delighted to help you organise this. 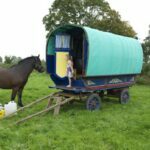 And if you prefer to be more static, or aren’t too sure about horses, then you can book to stay in one of Polly’s self-catering, static gypsy caravan at Kate’s Cottage in Alton Priors. 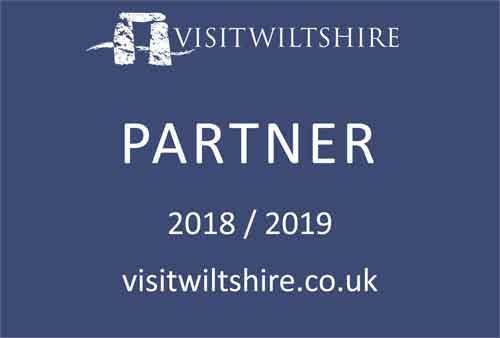 Bookable for either a single night or anything upwards, you can enjoy the peace and quiet of the Pewsey Vale – with dark skies and the natural world all around. At Kate’s Cottage, you will be right on the edge of the Pewsey Downs National Nature Reserve with all the walking routes it offers, and not far from Pewsey, Marlborough and Devizes for services and shopping. The Kennet & Avon Canal is just up the road at Honey Street and the surrounding villages have a wealth of traditional pubs for you to explore. 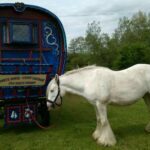 And to make the best of both worlds, you can still opt to do a day out on the lanes on the horse-drawn caravan as well (subject to availability). Previous experience of horses is helpful, but not essential. Assistance can be provided if you don’t feel confident enough after the training. The caravans are ideally suited for two adults and two children, but will sleep three adults. Simple cooking can be done on either a Calor gas cooker in the caravan or on an open fire in the meadows where you stay (landowner permitting), or meals can be bought at every stop. Bring wet weather clothing and wellies. One set of waterproofs for the driver is available. You should be prepared to walk sometimes to help the horse on uphill pulls, so you need to be reasonably active. This type of holiday is not suitable for children under five, unless accompanied by an older child or extra adult. 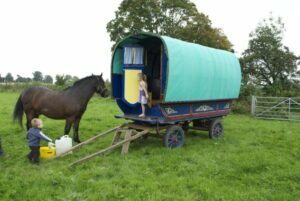 White Horse Gypsy Caravans are one of only two places in Britain where you can stay in a horse-drawn gypsy caravan! Opening Times: Holidays available from May to the end of September, either on Tuesday/Wednesday/Thursday nights or Friday/Saturday/Sunday nights.